Milan Kohout: SEPTEMBER, 2004, FORFEST FESTIVAL, "DEFENDING WHITE CULTURE"
SEPTEMBER, 2004, FORFEST FESTIVAL, "DEFENDING WHITE CULTURE"
I decided to do a performance piece which would focus public attention on the abuse of the human rights of the Czech Roma minority. During our visit to the festival, the whole country lived for the European Soccer Cup and the general population was watching their ?white only? Czech soccer players in hopes of lifting up their Czech white national pride. After I made initial contacts with the representatives of the local Roma community, I built a maquette of a soccer goal on the main city square. I used a flat surface which I then slowly painted with white paint. Then, while wearing completely white clothes and playing goalie defending the goal, I asked the Roma children to shoot a goal. They were using a black ball and before the offense always dipped it in a container of black paint. 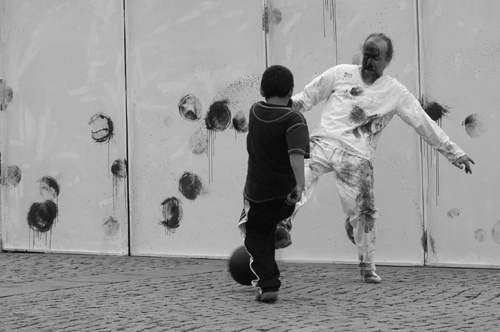 As the performance progressed my white clothes and the surface of the goal slowly became more and more covered with black spots being painted by the ball's impacts on the white surface. I just could not defend "my all white goal." After about an hour's duration of the performance, I was hit directly in the face. I then finished the piece since I had to go to the emergency room of the local hospital, where -- since I had almost lost my sight -- they had to wash the black paint from my eyes. The next day I invited all the participating Roma to a cafe on the main square, and a young waitress refused to serve us citing the reason that she "does not serve Gypsies." Then I immediately took all my Roma friends to the local state police station where, after initial refusal by the on-duty policeman, I forced him to make a report about a racist criminal act, which is a recently passed law in Czech legislation. The case will be heard soon by the local city council.